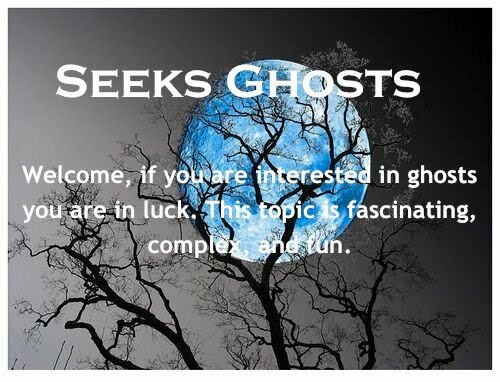 Living in New Mexico, I have heard about Julia Staab’s ghost for many years. 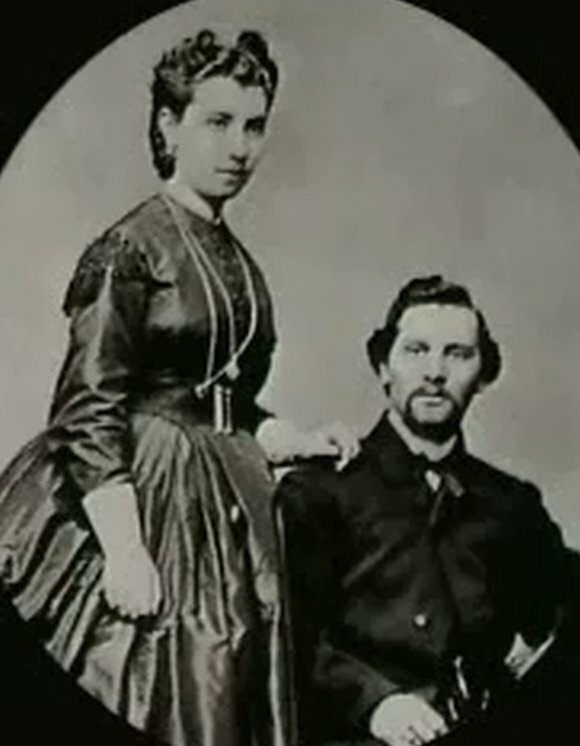 Her husband Abraham Staab made his fortune supplying goods to the U.S Army during the Civil War. He then moved to Santa Fe and was a very successful merchant. Abraham in search of a Jewish wife, arranged for Julia to leave her home in Germany and come to New Mexico territory in the 1870s. In 1882 he had an elegant three-story brick mansion--in the French Second Empire style-built on Palace Avenue in Santa Fe for his wife. The couple were very happy at first. They had seven children and Julia enjoyed showing off her beautiful European furnished home. The mansion’s third story ballroom became the center for Santa Fe’s social elite. It is stated Julia loved her home so much that she remained even after death. Julia’s life changed with the birth of her eighth child. He died shortly afterwards and Julia fell into a deep depression. It was around this same time she discovered Abraham was having an affair. With this added stress it is said her hair turned white overnight. She suffered through several miscarriages and finally descended into madness. She spent her last remaining years in her bedchamber. She died in 1896 of an apparent suicide. Her surviving children all grew up in the mansion. Their father Abraham died in 1913. The third floor ballroom burnt down around 1919. In the 1930s the Nason family bought the home and the six-acre surrounding estate with the intention of turning it into a hotel. They built a series of Revival-style adobe casitas around the existing Staab mansion and carriage house. The original entrance to the 19th century mansion can be seen off the lobby to the right near the hotel’s restaurant. As people walk up the staircase there is a sense of otherworldliness in the area. The second-floor guestrooms--originally the Staab family bedrooms still have many of their original furnishings. Julia’s large bedroom is now a favorite guestroom, #256. 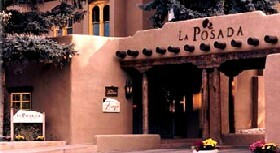 The Nason’s called their new hotel La Posada, which in Spanish means “inn” or “resting place.” Their hotel quickly became a popular gathering place for Santa Fe’s art colony. 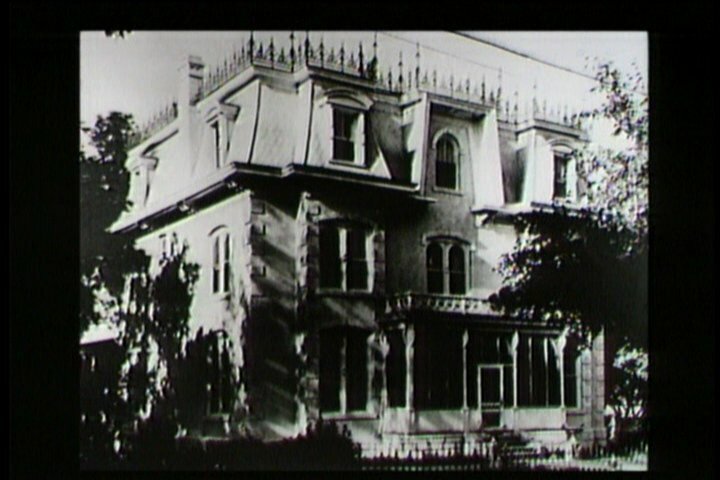 It was during the 1970s that Julia’s ghost first started to be seen by guests and employees at the hotel. Ten minutes later the furnace room door was open and it was working. Julia’s ghost is often encountered in her bedchamber. While alive she loved to take long baths. Guests that have stayed in her room report hearing the bathtub running in the middle of the night. Many guests have heard Julia’ voice and heavy breathing in the room as well. One couple checked out early because the husband saw Julia's ghost at the foot of the bed. A hotel employee who was giving a tour of the second floor knocked on Julia’s bedchamber door forgetting that no guest was staying in the room at that time. He was surprised to hear a woman’s voice state, “Don’t come in, I am dressing.” He quickly moved the group along. After the hotel was renovated in the 1990s Julia’s ghost was seen in many other areas of the hotel. A bartender setting up for service saw Julia’s ghost quietly sitting nearby. He and other witnesses that night saw several glasses fly off the bar. One experienced waiter kept dropping his tray of drinks. He told the bartender later that something kept hitting his tray out of his hands. One female guest using the downstairs restroom placed her purse on the counter upright. Within seconds all of her make-up flew out of her purse and scattered across the floor. Two of the cleaning staff also encountered Julia’s ghost. A maid cleaning a male guest restroom spotted Julia’s image in a mirror staring at her. When she turned around no one was there. A janitor mopping a floor looked up and saw Julia's brown eyes staring intently at him. He was so unnerved he quit. Several of the kitchen staff report pots and pans fly off their hooks and the lights in the room often flicker. The sink taps often turn on and off, the plumbing has been checked but no apparent reason has been discovered. Today the Posada de Santa Fe Resort and Spa is one of the cities finest hotels. Elegant gardens and fountains surround the hotel. 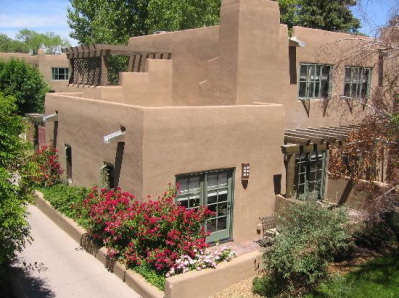 It is located just two blocks east of the historic Santa Fe Plaza. The following is a segment that Unsolved Mysteries did about Julia Staab's ghost. This is the strange and chilling tale of a Dutch freighter ship, the Ourang Medan, which sent out a SOS distress signal in June of 1947 while crossing the Straits of Malacca between Sumatra and Malaysia. Some state this tale is just an old sailor’s yarn told to amuse. But this explanation is too simplistic if the following is taken into consideration. Many ships heard this distress call and reported it. The incident was written about in 1952 in a U.S. Coast Guard publication. The result -- more than one person has tried to investigate it but it remains a mystery to this day. “An officer including captain are dead, lying in chartroom and bridge. Possibly whole crew is dead.” A burst of indecipherable Morse code was heard and then these final words: “I die.” After this last grim message all was silent. The two American as well as the English and Dutch ships that heard this disturbing message where able to “triangulate” or determine the location from where this message was sent. An American merchant ship, the Silver Star was the closest to this location so they quickly changed course. Within hours they spotted the Ourang Medan across the straits’ choppy waters. At first they tried to hail her by whistle and hand signals but when they received no response the Silver Star’s captain arranged for a group to board her. What these Silver Star crewmembers discovered aboard the Ourang Medan is described as “a living nightmare.” The deck, wheelhouse and bridge where covered with dead bodies. Horrified this crew saw that each decaying face was frozen into an expression of terror. Each dead seaman was staring their eyes wide-open and their mouths agape. Each corpse was positioned with arms outstretched as if they were still locked in battle with some unseen assailant. When the crew explored further they found more bodies below deck in the ship’s charthouse and boiler room. Each of these dead men also had a look of grim terror on their face. The ship’s communication officer was found dead sitting with his fingertips still on the telegraph. The crew quickly returned to the deck finding the chartroom and boiler room below were both extremely cold--this despite the temperature outside that day was a sizzling 110 degrees. 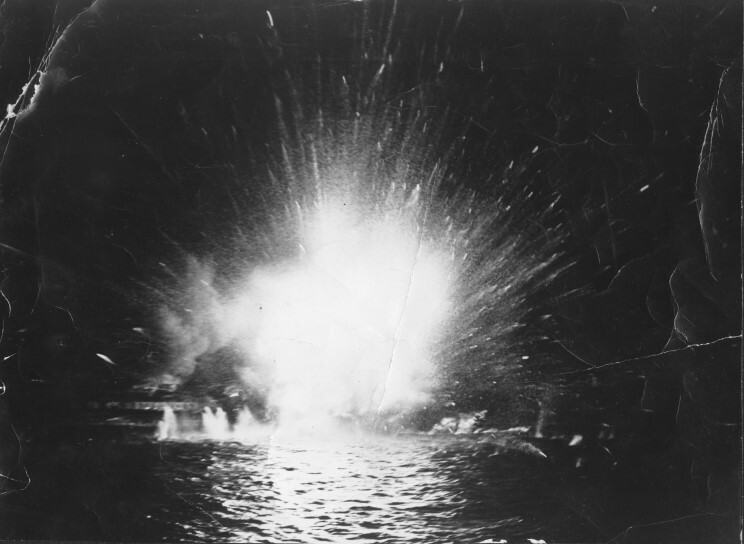 Their captain determined that they should attach a line to the Ourang Medan and tow her ashore but as his crew was doing this they saw the Ourang was on fire, smoke was billowing from below her decks. These men barely had time to cut the towline and make their way back to the Silver Star before the Ourang Medan exploded. It is said the Ourang rose with a tremendous force out of the water and then sank swiftly. In the years before and since the Coast Guard account was written rumors swirled about this strange incident. Besides the positions and expressions on these corpses, which pointed to the fact these sailors must have “suffered profoundly at their deaths” was the fact that no injuries or wounds were found on any of them. Plus the ship was not damaged in any way until it exploded. So the reason for their demise resulted in much speculation. Researchers that have tried to determine what actually happened to the crew on the Ourang Medan have all hit brick walls. One reason this tale is considered a legend is that fact that there are no official records that this ship ever existed. But as I mentioned above, this does not mesh with the fact many ships heard the Ourang’s distress call, and it is believed by many that the Silver Star did change course and it did discover this ship. In contrast, an article published in the Fortean Times entitled A Cargo of Death states the Silver Star didn’t exist. It did. Of course many have speculated what exactly caused these men’s deaths--which I find fascinating since in the same breath it is mentioned that this incident didn’t actually happen. Many theories have been suggested, some more far-fetched than others. 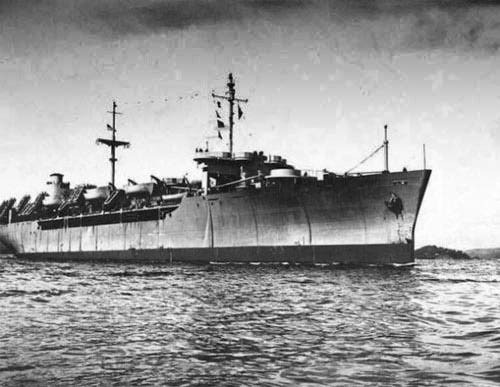 One mentioned often is since this ship sank right after the Second World War it’s relative obscurity was used to transport chemicals used to make poisonous gas--it is stated if salt water hit these chemicals it would have killed the crew and then eventually caused the explosion. An interesting note about this theory is some believe that the real name of this ship was changed to disguise the fact that it was transporting these chemicals. Regardless, if this theory is believed one still has to wonder why this mixture of gases plus the salt water didn’t cause the ship to explode immediately. Another theory states that the ship’s boiler must have malfunctioned causing a carbon monoxide leak. The crew then inhaled these fumes and died. But why did the seaman on deck not survive. Wouldn’t the fresh sea air have saved them? A third theory presented involves “methane bubbles” surfacing in clouds from a hole or fissure in the sea floor which then asphyxiated the crew. This theory is at fault because these bubbles could not have caused the ship to explode. One has to wonder if these bubbles could kill the entire ship’s crew? Others speculated that pirates boarded the ship and attacked the crew but this was immediately ruled out because there were no marks found on any of the bodies. An article in Fate magazine in 1953 stated that since none of the mainstream reasons purposed were solid it could have been something paranormal that caused these deaths. 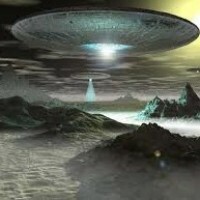 One rumor stated after this in 1965 involved a UFO. It was put forth that aliens must have attacked the ship. Another reason given is based upon the fact that the Silver Star crew experienced a feeling of immense cold in the Ourang Medan’s lower decks. This caused speculation that “ghosts” had something to do with the crew’s demise. What really happened remains a mystery--that’s if this incident really occurred. This story is a good example of how tales regardless of whether they are based in fact of fiction take on a life of their own and become legendary. Update: Here is a link to the Skittish Library with an interesting take on this story. Chillingham is a medieval castle located in northern England in Northumberland. It is near the coast and the English-Scottish border. This castle played a significant role in the bloody war between the English and Scots in the 14th century. Below this castle is a small dungeon room that is by far England’s most infamous torture chamber. 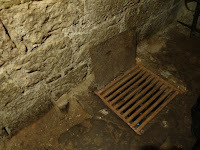 It is estimated that over 7500 Scots, including men, women, and children of all ages were tortured and killed in this dungeon over three years. Chillingham Castle was an important strategic location for both the English and the Scottish during this war. It was used as a starting point for King Edwards 1s armies to enter Scotland. The Scottish led by William Wallace-- often attacked the castle. 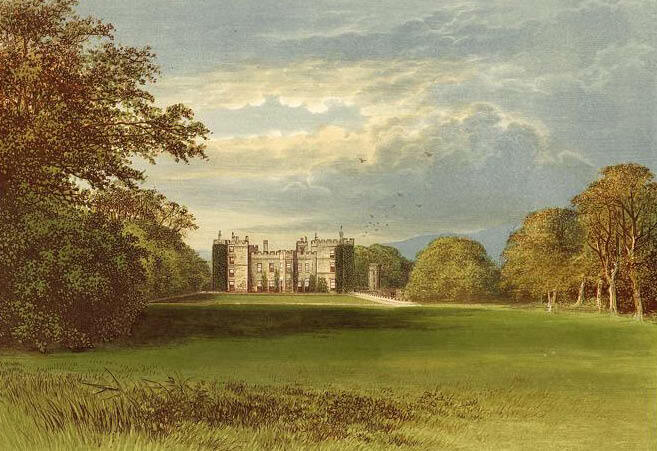 It was at Chillingham where William Wallace made his base-camp in 1298 after a successful attack upon the English. The following is more terrifying than most horror stories because it is true. The torture that took place at Chillingham resulted in more than one haunting. This dungeon chamber still vibrates with the last breath of the Scottish victims of this bloody war. Marks can be seen on its walls where prisoners kept track of the number of days they were tortured before death finally released them. The screams, cries, and smells of these victims--many of them innocent--are still felt, smelled and heard in several of the castle’s rooms. The variety of torture devises used in this room is each more horrific than the last. 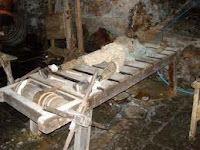 Besides the usual implements of pain, such as a rack, thumbscrews, chains, leg irons, man traps, and an iron maiden this chamber also had other insidious items. To name just a few, a boiling pot, branding irons, items used to gouge out eyes, a bed of nails, and a chair with lethal spikes on the seat. Some captives were tied into a barrel full of spikes and then rolled around until the flesh ripped from their bodies--only death brought relief from this agony. Other victims had a cage strapped to their stomachs. Within this cage a starved rat was placed--its only way out was to eat its way out through the victim. 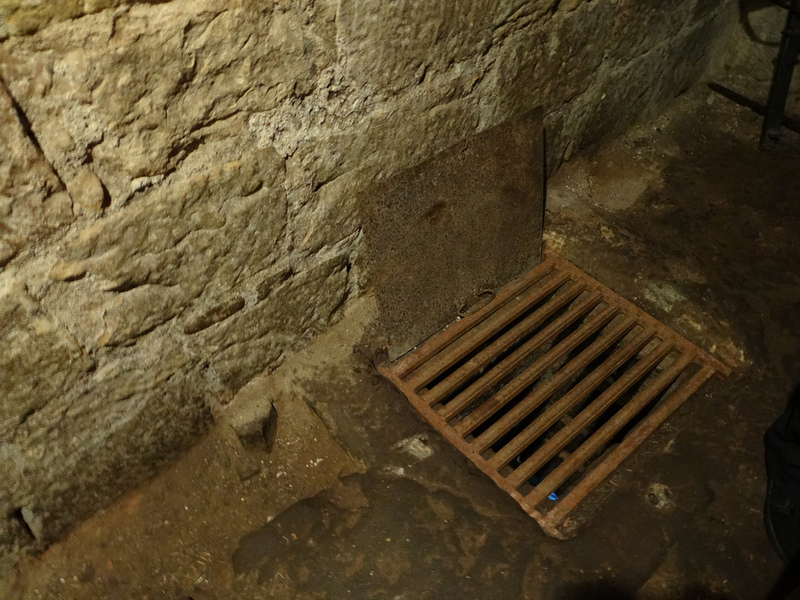 The chambers’ floor was purposefully built on a slant, this was to allow body fluids, such as blood of the tortured to drain down into a trench that was at one end of the room. 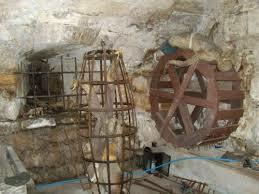 Many victims had their arms and legs broken and were thrown down a twenty-foot oubliette. * They then were left to starve. Some resorted to eating chunks of other victims’ flesh or even fragments of their own in a vain effort to prolong their lives. The bones of the last victim to be thrown down can still be seen today. They are the bones of a female child. Her ghost has been spotted looking up at visitors. Staff and tourists have taken photographs in this torture chamber-- strange light anomalies have shown up in their pictures. One Guide that gives tours of the castle states that he will not enter the torture chamber alone. He and others feel there is a very malevolent presence in this dungeon. Some state this ghost is the man responsible for the torture. John Sage was one of Edward Long shank’s best soldiers, rising to the rank of lieutenant. When he was wounded and could no longer fight, he asked the King for another assignment. He was then appointed Chillingham's torturer. When the war finally came to an end, it is stated that Sage rounded up what was left of the Scottish men, women and older children prisoners in the castle and took them into the courtyard and threw them on a bonfire. 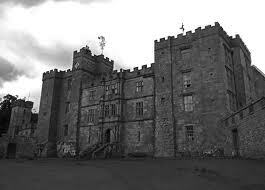 The younger children were kept in “Edward’s Room” on the top floor in the castle as their parents burned alive. They could smell their parents burning flesh and hear their screams. Sage knowing these children would take revenge when they grew up then grabbed a small ax and chopped these children to pieces--including ones as young as a year old. This room is known today as the “Killing Room.” It is one of the more haunted areas in the castle. Furnishings, including a chandelier move without cause and soft voices and footsteps, are heard. John Sage met as violent an end as most of his victims. While making love to a woman, Elizabeth Charlton, on the rack in the torture chamber he accidentally killed her. Her father was a member of a gang of outlaws who were tribal leaders and broken men, known as the Border Reivers. Wanting revenge for his daughter’s death, he threatened Edward Longshanks. He warned that his group would join the Scots in a battle to take Chillingham if Sage was not punished. The King knowing they would probably succeed since the war had left him broke agreed to hang Sage. A large, enthusiastic crowd gathered to watch Sage’s execution. He was hung from a tree near the castle grounds. As he slowly died people cut off his fingers and toes etc. for souvenirs. His ghost is seen and heard wandering the castle. Some witnesses state that his spirit has followed them around. People sense evil when his ghost is present. Chillingham Castle has survived for over 800 years. Today it is open to the public for private and public events. Several other ghosts haunt the castle but they are not connected to this particular point in history so I will save their stories for another post. This castle has so much activity that they retain their own paranormal team. Public events such as “night vigils” are regularly offered to those who are interested. Visitors can also stay in apartments within the castle. * Oubliette is the French word for forgotten. ** To be fair let me note--this war was cruel on both sides. The Scottish crossed the border and set churches on fire with woman and children locked inside. Aokigahara is a 14 square mile forest located at the northwest base of Mount Fuji in Japan. It is an eerily quiet forest for there is minimal wildlife. The forest floor sits on volcanic rock and its nickname is Jukai, which means “Sea of Trees” because the growth is so dense. This forest has a historic association with demons and is considered one of the world’s most haunted spots. In the 19th century Aokigahara, was a location used for the practice of ubasute. This practice was when during periods of long drought or famine families would take elder members of their family to an isolated area--in this case Aokigahara-- and leave them to die. Some state this practice was just a myth others state it is because of this practice that the Aokigahara forest is haunted by Yurels, which are the angry spirits of the old people left there to die. Many who enter Jukai get the sense that someone is watching them. Others get such an overpowering sense of oppression that they leave as soon as possible. 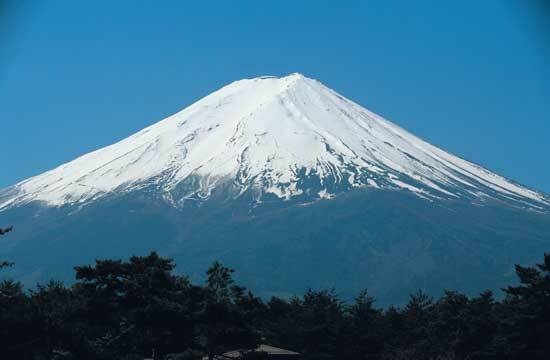 Hikers and campers have heard footsteps follow them when they are the only ones in the area or on the trail headed toward Mount Fuji. Regardless of whether this myth is believed or not, Aokigahara is still considered haunted and for a much more modern reason. 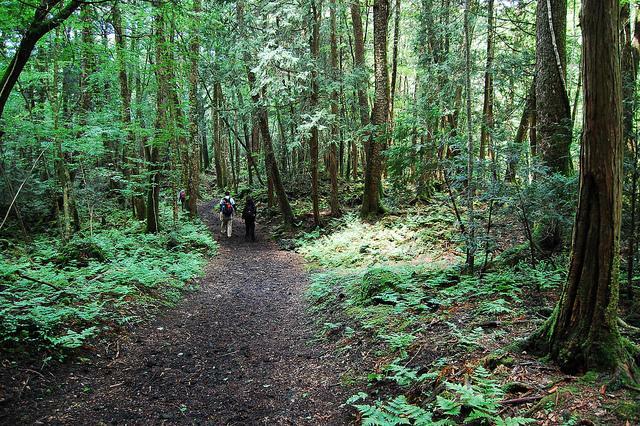 Since the late 1970s Aokigahara sadly has become Japan’s most popular spot to commit suicide. Today over 100 people walk into this forest each year and take their lives. This forest is so dense that some who have changed their minds and tried to get back to the main trail have gotten lost and died. The proverbial yellow tape that is used to cordon off areas where people have camped and then killed themselves always strikes journalists who have visited this forest. Signs are posted everywhere both in English and Japanese in an effort to change people’s minds. Abandoned cars are often found in the parking lot near the trail. There are so many suicides that Yukuza * pays homeless people to sneak into the Aokigahara forest in order to rob the corpses of their possessions. * Yakuza is an organized crime syndicate that operates in Japan and internationally. Here a video of a tour given of the Jukai suicide sites by a Japanese geologist, Azusa Hayano who studies volcanos. He has found over 100 suicide corpses. Warning-- there are some graphic pictures of these suicides shown in this video.